And more. Be sure to subscribe to us on either iTunes or Spotify, and you can view the whole archive here. Season 2 was off the hook! In season 2 I took a different approach to the CredoCast. Instead of just audio (you can still hear the just-audio versions within the posts and on iTunes), we did videos, transcripts, and audio. Episode 1 – Jeremy Smith of SimpleTiger on remote agencies, getting fired, and building a business with his brother. Episode 2 – Brandon Doyle of Wallaroo Media on quitting his job and losing all of his clients in short order, building an agency, and working with his best friend. Episode 3 – Mike Arnesen of UpBuild on getting fired and building the business he has always wanted to build. Episode 6 – Akvile Harlow of Akvertise on two years solo consulting, lessons she’s learned, and how she get her start as an entrepreneur as a child in Canada. Episode 7 – Blake Denman of Rickety Roo on leaving a job and taking his clients with him, building an agency in Bend Oregon, and more. Unfortunately I lost some episodes on the web in a site migration, but these are the episodes we have live on the web. All are still on the iTunes store. I have heard for years from a lot of people that they want to start consulting or own their own agency, but they don’t know how to do it. Well, there are a lot of people out there who know how to do it and those are the founders themselves. 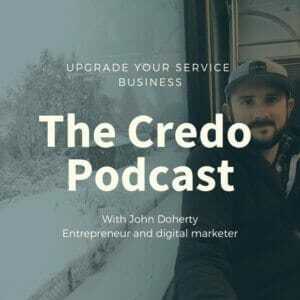 Season 3 was the start of a more focused podcast with episodes 7-10 minutes long going deeper into a specific strategy or tactic to help you grow your service business with better marketing, better sales, and better business processes.